Urban Frill is seeing red in a fabulous blazer! Click over to see how she mixes it with bright colors for a transitional spring outfit! Lipstick & Lollies is taking her inspiration from J.Crew and wearing the cutest green blazer! Add in a little leopard and this makes for on amazing outfit! 100 Inspirations shows us how to get Eva Longoria's look complete with leather shorts! Stop by to the pieces she chose to recreate this sassy look for under $110! Love this! Going to check out a few of those blogs now :) And that romper you're wearing is too cute! I love the red blazer in the very first picture. Great list this week! I of course, love your romper. Yay, links are always fun! I like finding new inspiration from different sources. Just wondering, but how do you come across these? Looks like there are some new bloggers for me to check out :) Love all the looks! Super cute! Love this post :) Going to check out some more photos of these amazing outfits!!!!! Cute post. Checking out these blogs now! 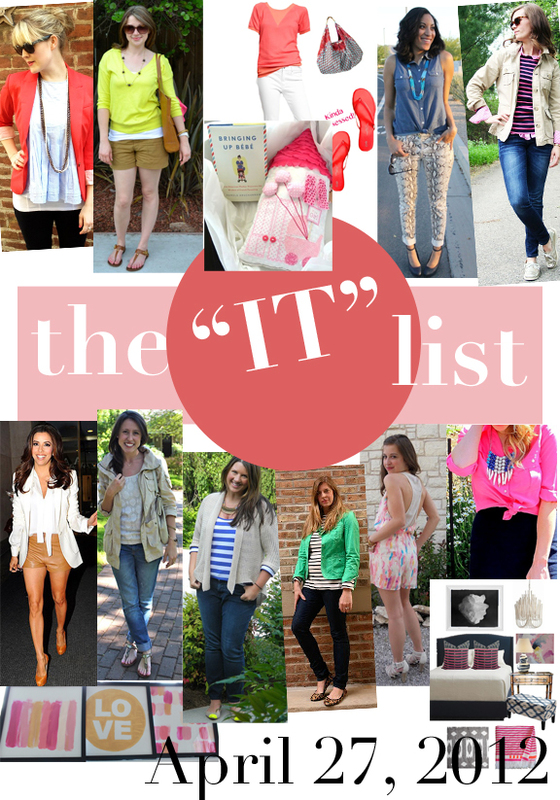 I've never heard of the "it" list...thanks for introducing me to it and to your blog. It was so sweet of you to stop by Wrinkled Chiffon and leave a comment. Have a great weekend and I hope you can stop by again today and see my WORK style and number 30 of My One Hundred! Hey you have a very beautiful and interested Blog! Awesome and congrats on being on the "It List" again! You're definitely one of my fave fashion/style bloggers. I love Evas look with the leather shorts! What a great list - everything and everyone looks wonderful! Great it list, good ideas, good to be stolen :)))! Thank you so much for your nice compliment, dear! Let me know would love to follow you back.